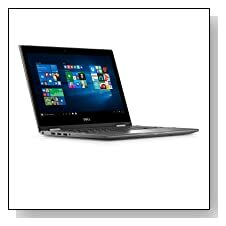 Silver Dell i5368-10024GRY is a 13.3 inch 2-in-1 laptop with Full HD touch display, a sleek design with thinner bezel and larger screen space, solid 360 degree rotating hinge for laptop, tent, tablet and stand modes, large Solid State Drive, backlit keyboard and 802.11ac wireless. It includes an ultra low voltage dual core Skylake Intel i7-6500U processor at 2.5GHz- 3.1GHz speeds with turbo boost and hyper threading for two cores to handle four threads in parallel, 8GB DDR4 RAM at faster 2133MHz speed for very decent multitasking power, generous 256GB SATA-3 SSD for both speed and size and Windows 10 Microsoft Signature Image. It has a comfortable and ergonomic keyboard without the numeric keypad and high resolution touchpad for smoother and quicker navigation on Windows 10 screen and apps. 13.3 inch FHD LED-lit wide angle touchscreen with Intel Real Sense has the 1920 x 1080 pixel resolution for crystal clear images and IPS panel with as much as 178 degree viewing angles horizontally and vertically so it will be more fun to view photos and videos too. Inspiron 13 5000 weighs only 3.4 pounds and measures 12.7 x 0.7 x 8.9 inches- is very slim and lightweight and portable for such a powerful machine with a FHD touch display. 4-cell 56Whr lithium ion battery is not removable and should give you 4 hours or so on average use, which is not a lot for a portable 2-in-1. There is no Optical Drive on this one due to the convertible design and slim chassis and the way they had to fit in quite a bit in a small area, and some basic connectivity including the Ethernet with RJ-45 connector, 802.11ac wireless, 2 x USB 3.0 ports, a USB 2.0 port, an HDMI output and a 3-in-1 Media Card Reader that supports SD, SDHC and SDXC formats. Passmark benchmark score of 4326 may not seem like a lot for an Intel i7 processor and can be more compared to some of the i5 processors, focus is also on improved power efficiency but the battery life is not that impressive. Laptop and tablet in one computers generally cost more than regular laptops so you pay extra for the design and portability and also that you don’t have to pay for a tablet if you want one but this often means getting less in terms of the technical specs and features- less CPU, memory and storage resulting in worse performance. 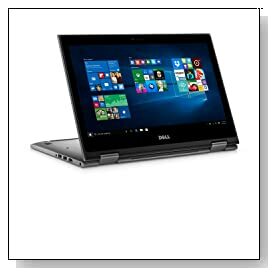 This Dell 13 is equipped with some pretty high specs including a late 2015 release i7 processor, a large and fast SSD and RAM so the performance level is quite high, so is the price. 8GB is placed on a single stick with the second one empty perhaps for another 8GB. SSD is way faster and much more durable than both the 5400rpm and 7200rpm HDD mechanical drives and will boot up the system fast and apps and files will open much quicker. You can get this 2-in-1 if you want a powerful / high performance laptop and tablet in one as this will be doing anything you want on this machine efficiently- both your daily and more demanding tasks without any lagging whatsoever but not play advanced games at high settings as all it has is an Intel HD 520 integrated card with similar performance to GeForce 820M that can not be compared to any of the mid-range dedicated cards for gaming power.